Are you ready for some face melting guitar riffs? Click here to play! Are you ready for some monster tunes? Are you ready to Get Rocked? Hairband is in town so spin these reels for a front row seat at their latest concert. You’ll want to get the attention of every member of Hairband. Start off with the lead singer. He’s screeching out the high notes and is acting as a wild symbol. He will not only replace most other symbols to create wins, but he’ll also pick up up to 5,000 times your line bet. Move on to the guitar player. This band member knows how to wail on the strings, and he’ll also payout up to 3,000 times your line bet. There are also bass players, keyboard players and drummers that will payout up to 2,000, 1,000, or 500 times your line bet respectively. The Rock stage symbol is a particularly special symbol as it acts as a scatter. It will multiply your total bet if you spin two or more anywhere on the board. 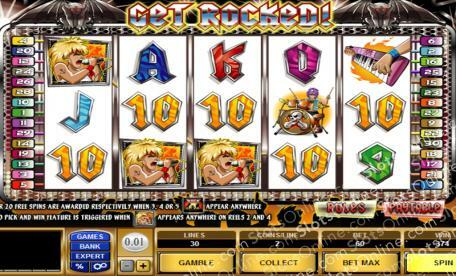 It will also trigger a number of free spins if three or more appear anywhere on the board. The Rock stage symbol is a scatter. Two or more anywhere on the board will multiply your total bet by 2, 5, 20, or 200 respectively. Three or more anywhere on the board will trigger up to 20 free spins . The singer is a wild symbol. He will replace all others, excluding scatters, to help you create more wins. He will also trigger a bonus feature if he appears on selected reels. If the singer appears on reels 2 and 4 at the same time you will trigger the Solo Pick and Win feature. During this game you will have to choose a musician to performa a solo for bonus prizes.